Check your cabinets, people. General Mills just issued a recall for 10 million pounds of its flour, in connection with a potential E. coli outbreak. There are as of yet no confirmed cases of E. coli connected to the flour at all. But, starting December of last year and continuing till this month, the CDC began an attempt to track down the source of an E. coli outbreak that had sickened 38 people across 20 states. At least half of all the people who got sick reported having baked something with flour prior to getting sick. That alone isn’t enough to confirm that flour was the source. But it was enough for General Mills to issue a voluntary recall out of what they described as “an abundance of caution.” In addition, the company is also reminding people not to eat raw cookie dough or cake batter. But why, after over five months of investigations, is it so hard to track even one case (of the more than three dozen) to its source? It’s the same reason the culprit behind Chipotle’s E. coli outbreak was never revealed. Some bacteria get people sick within hours, and in those cases it’s fairly simple to find and test a source. E. coli, however, usually takes from three to 10 days to hit. By the time a common food among all the people who are ill has been traced to a particular kitchen, whatever ingredient that was getting people sick is most likely gone, making simple testing an impossibility. Which means that when tracking E. coli, you’re almost always weeks behind the curve—and once someone has gotten sick, there’s even more time devoted to confirming that it’s really E. coli and that every illness is part of the same outbreak. Combined, each case takes almost up to three weeks to confirm. Tracking the source of food poisoning is detective work. By the time the case gets started—especially for an illness with such a long lag, like E. coli—the trail has usually already gone cold. While there’s often a suspect, it’s not uncommon for these mysteries never to be solved. I’ve reached out to the CDC for details on the investigation and will update as they come in. 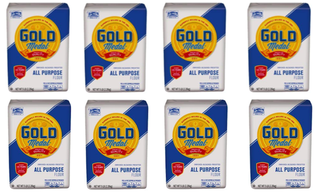 In the meantime, you can see all the impacted brands of General Mills’ flour—including several varieties of the Gold Medal brand—right here.